Some people love Valentine's Day, others hate it... I'm mostly indifferent. But you know what I adore? A good love story! There are plenty of other readers who would agree, and what better time to recommend a few romantic reads that I loved recently? Whatever your romantic situation or mood, these seven books will keep you up late and leave you swooning. Because, as they say, book lovers never go to bed alone. Results May Vary by Bethany Chase asks the question, Can you ever really know the person you love? And it does so with an incredibly heartbreaking premise - Caroline Hammond discovers that her husband is having an affair with a man. It's a revelation that upends everything she thought she knew about her past, loves about her present and expected for her future. From the very first page, Chase drew me into this story. I experienced an entire range of emotions along with Caroline - the anger, the grief, the sense of betrayal, the confusion about what to do and how to move forward. I can't praise Chase's writing enough! I loved getting to know Caroline's support system, seeing her in her element as a museum curator, and watching her navigate all of the changes in her life. From the dialogue to the setting, everything felt realistic and fully fleshed out. It's an emotionally heavy read, especially since I'm recommending love stories, but it ought to be on your radar. It looks at love through an unexpected lens, and I couldn't put it down. If you want to see a smart and strong woman rebuild her life after everything seems to fall apart, then you need to pick up Results May Vary! I So Loved It and think you will, too. 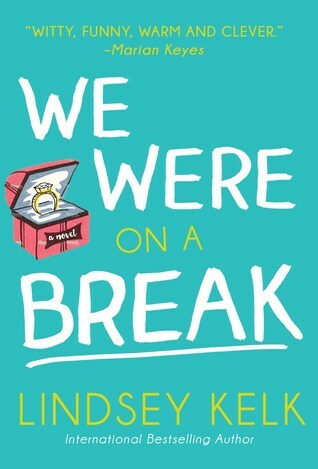 If the title of We Were On A Break by Lindsey Kelk makes you think of that famous and unforgettable phrase in Friends, you're not alone. And that might give you an idea of what to expect in this book! Liv and Adam are in love, and they're supposed to get engaged soon. Well, that's according to Liv's best friend... but she's married to Adam's brother, so the information seems legit. However, on the night Liv is expecting Adam to propose, he suggests they take a break. It blindsides her! Where is this coming from? We Were on a Break is written from both perspectives, which made for some very funny - and very frustrating - moments. My main complaint is that the slightly slower pace made the question of whether or not Adam and Liv would sort out their issues start to drag near the end. But the characters were relatable, the dialogue was funny and the setting was interesting, though I might be biased because I want to live in England. If you're someone who yells at characters, "Just talk to each other already!," this might not be for you. But if you can handle a little miscommunication (that felt realistic), consider reading this book. I So Liked It, and it's a great choice if you're craving a light romantic comedy. I can't remember the last time I read a book by Sophie Kinsella, but the cover of My Not So Perfect Life caught my eye on NetGalley and I couldn't resist. That was an excellent decision because this book is a gem! Katie Brenner may look like she has the perfect life, but that isn't the truth of the matter. She shares a tiny flat in London with terrible roommates, isn't valued at work and can barely afford her already frugal lifestyle. She keeps hoping things will change, and they finally do - just not in the way she hoped. Her glamorous boss, Demeter, fires her, and she has to move back home to help her dad set up a glamping business. An opportunity to get back at her boss presents itself... what will Katie do? Honestly, this book was a joy to read. It's got a little bit of everything - workplace drama, supportive family relationships, charming setting, hilarious situations, an adorable romance and an empowering message. The romance wasn't the main story, though it was a wonderfully swoony addition, and I appreciated that Katie's personal growth was the focus. Plus, I loved the way the book dealt with the filtered and idealized version of life versus the messy reality. I'm So Obsessed With It and can't recommend it highly enough! At this point, I think it's safe to say I'm a Mhairi McFarlane fangirl. 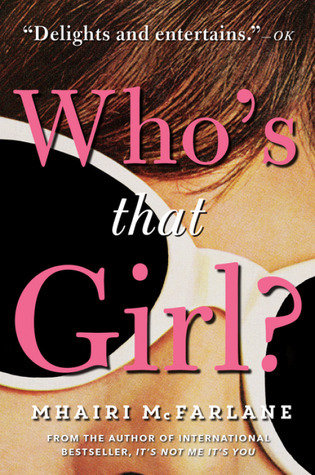 I've loved all of her books, and her most recent release, Who's That Girl?, is no exception. In fact, it just might be my favorite so far! Edie is good friends with her colleague Jack, but then he kisses her on his wedding day... and his new wife sees them. All of the blame falls on Edie, she's shunned by pretty much everyone she knows and becomes the target of online bullying. As you can imagine, it makes her office environment super tense. To diffuse the situation, her boss sends her back home to Nottingham to ghostwrite an autobiography for a hot new actor, Elliot Owen. Edie can tell Elliot's going to be a total pain, which just adds to the stress of moving back in with her widowed father and lazy sister! I loved Edie - she's smart, capable, and funny but she doesn't really know who she is and value what she brings to the world. And if you love "normal girl falls for famous guy" stories, pick up this book! The romance isn't the focus, but it's done so well. McFarlane's trademark wit and humor can be found throughout, but it still tackles some serious themes in a thoughtful way. If you want a book about discovering your worth, this is it! I'm So Obsessed With It. 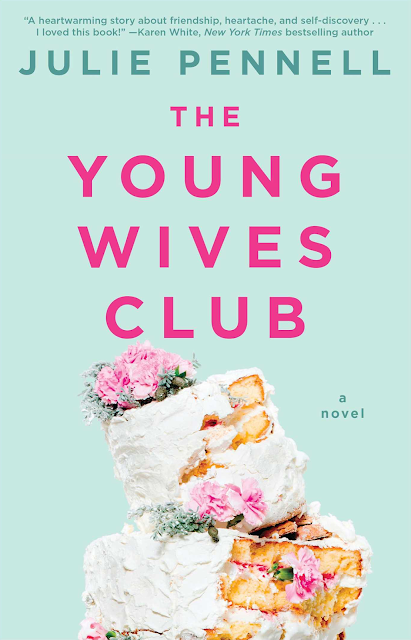 Truthfully, The Young Wives Club by Julie Pennell isn't a swoony read. Yes, I know that makes the subtitle of this post misleading, but I didn't want to change it and had to include this book. Hear me out! Set in a small town in Louisiana, it's the story of four friends who have each other's back through thick and thin. They're muddling through different romantic situations: one is a newlywed, one is a new parent, one is in a new relationship and one still holding out that her love will finally commit. Although they're in different places in their lives, what I loved is that they all have similar lessons to learn. Their growth (both individually and together) is at the heart of the story. Each of the four girls gets their own point of view, which was initially confusing but got better over time. It's a character-driven story with engaging writing and an interesting Southern setting. The plot sometimes felt a little far-fetched, but the characters' journeys were worth reading. Their romantic relationships aren't really the point - because honestly, almost every man in here is awful. But this is the book to pick up if you're looking for female friendships and women learning who they are and what they want out of life. I So Liked It, and I couldn't put it down once I started it. As a huge fan of Pride and Prejudice, I was more than a little nervous starting Eligible by Curtis Sittenfeld. A modern retelling of my favorite book from an author that I've DNF-ed in the past? I wasn't expecting great things. But honestly, I was pleasantly surprised! Liz, a magazine writer in her late thirties, and her older sister Jane, a yoga teacher, return home from New York after their father's health scare to discover their childhood home is practically falling apart. Kitty and Lydia are too absorbed in their CrossFit workouts, and Mary is spending all her time working on her third master's degree online. And Mrs. Bennet, of course, is obsessed with marrying off her daughters. That's when we meet Chip Bingley, a handsome doctor who recently appeared on a Bachelor-esque dating show, and his friend Fitzwilliam Darcy. You can predict some of what happens next, but Sittenfeld updated the story in a way that made sense, felt fresh and was overall quite enjoyable to read. I thought the writing was clever and matched the playful tone. The romance was nice, though it pales in comparison to the original, but the family dynamics were spot on. However, you might want to skip it if you're an Austen purist! It won't work for everyone, but I So Enjoyed It. 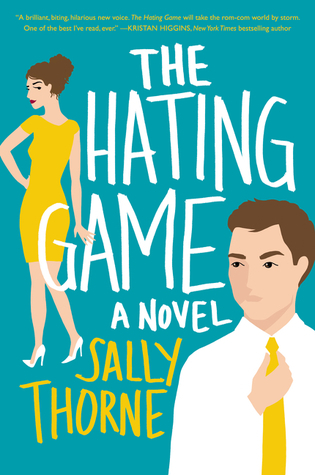 I knew nothing about The Hating Game by Sally Thorne when I requested it for review last year. If you've spent any time on bookish Twitter lately, there's a good chance you've already heard rave reviews for it - but let me add mine to the mix! Lucy Hutton and Joshua Templeman hate each other with a passion, which makes work a challenge since they are executive assistants to co-CEOs of a publishing company. When they learn they're up for the same promotion at work, all that anger comes to ahead. But is all that butting heads and bickering covering up another kind of tension between these two? I think you can probably guess the answer to that question, but you still need to pick up this book to see it for yourself. I've always had a soft spot for hate-to-love romances (Pride and Prejudice and Anne of Green Gables, anyone? ), and this was definitely a new favorite for me. The characters completely charmed me, even when they were being exasperating. There were so many moments that made me laugh out loud, and I even read a few passages to my husband because he was dying to know what I thought was so funny. I So Loved It for the banter, the tension and the quirkiness of both the main characters. What book are you in the mood for this Valentine's Day? *I received a copy of several of these books from publishers for review consideration. This did not affect my opinion of the books or my review. I love these recommendations! I've been trying to mix up my TBR lately with more adult titles, especially when it comes to romance, as I've felt less engaged with YA romance lately. I'm really excited to try these recommendations, especially The Young Wives Club, which I just received in the mail today! These are fantastic recommendations! I love that you covered so many different scenarios. I've only read The Hating Game so it looks like I have some catching up to do :) The cover of The Young Wives Club is making me crave cake haha. Honestly, Hannah, I'm always so inspired by your creativity when it comes to posts! This one is no exception. I love that you categorized each read specifically :D Also, Maybe in Another Life was so much fun!